The Japanese have an almost unnatural affection for onomatopoeia, which Messrs. Funk & Wagnall tell us is “the formation of a word from a sound associated with what is named.” Simply put, a word that mimics a sound. We English speakers use onomatopoeia, too. Consider words like “sizzle,” “splash,” “boom,” or that famous Alka Seltzer jingle from the late 1970s. One example of Japanese onomatopoeia is “mofu mofu” もふもふ. It is commonly translated as “fluffy” although that’s not really accurate. More properly, mofu mofu connotes the sound and feeling of stroking or burying one’s face in something soft and furry. As you might imagine, in the Land of Anime, mofu mofu is often applied in strange and weird ways. Google it at your own risk. My current favorite use of mofu mofu is a promotional video developed by Japan’s Akita Prefecture which seeks to expand tourism by leveraging the area’s bushy, eponymous dog. Warning: watching more than 30 seconds of this video may result in irreversible brain damage. Over the past few weeks we’ve been calling Max our personal mofu mofu dog. That’s because at his last haircut in July, the groomer (a temp, our regular was on maternity leave) gave Max a poodle cut instead of a proper Maltese cut. I know, I know, we were horrified, too. Poodle cuts are cute on poodles. They are an abomination on Malts or so Max tells me. So we have been letting his hair grow so that we can restore his dignity and usual tonsorial splendor. Common or garden variety of poodle cut. Photo by some poodle person, not me. During the haircut hiatus, the Fuzzpup’s locks have gotten quite long and Maltese hair is very, very soft. Hence, the mofu mofu nickname. The Malt we got back is wholly different looking than the Malt we dropped off. So, here are the before and the after photos, taken within 3 hours of each other. Which look do you prefer? Mofu mofu or post-haircut? hey, hey–I did waffle a bit, but I was named as having gotten Little Max right. OK, I watched until about 1:24. My brain is terribly damaged. The audience seemed to like this. Something is not right here…..
OK, I reviewed the evidence just like the Senate does and after a brief investigation I award you a half point for your call. Yeah, the video is hard to take. It features many of the Akita Prefecture specialties and is thus meaningful to Japanese but for others it’s just another entry in the “weird Japan” category. He’s pretty cute either way, but I kind of like the before version. He looks more substantial. That could just be the difference between photos and reality, though. Maybe in real life he just looked shaggy. He looks much better in the photo than he did in real life. Plus he tends to get mats in his hair when it gets long. I’m of two minds myself. I sort of like bushy Max because of how he feels – mofu mofu – but the AJF likes trimmed Max so you know the outcome of that discussion. I don’t know anything about Maltese hair, but I have a similar aesthetic dilemma with Jacques. I wound up brushing him more often — every day, when I stay on top of it — and getting the groomer to cut back on the little pantaloons and all that they love to do. I have this little thing that looks like a scraper — I feel a blog post coming on — that pulls out the dead hair, so he looks sleeker, even when his hair is longer. It takes maybe 15 minutes, tops, pauses for treats included. As for the SO situation, mine is just kind of blown away. He wanted a slight change to his life and he got a crazy American with a big house, a little dog, a vintage sports car and friends who love-bomb him, which is so not French. I don’t think his head has stopped spinning. But when it does, yeah, I think he’ll prefer the more-trimmed version. We’ll see. Jacques is a real dog with real fur, right? The kind that sheds on occasion? 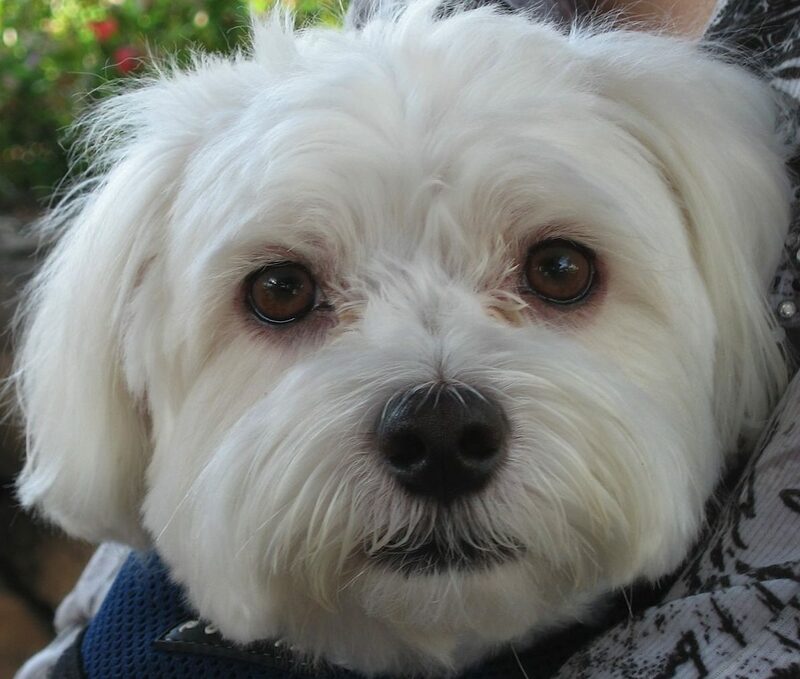 Maltese don’t have fur; they have hair, no undercoat and don’t shed. Now I think we all need a blog post featuring Jacques in that vintage sports car! Why do those flanking the ‘dogs’ carry firearms? Is it for crowd control? Max has a hard life…dragged through dusty mountains, washed to within an inch of his dignity, forced to imitate a poodle…no wonder he felt in growly mood. Looks all soft and cuddly in the before…smart in the after. The real answer is that Akita Prefecture was drawing attention to certain historical incidents where the guns were a significant factor in the outcome. The better answer is that the two guys with guns were sent to summarily execute the guy who came up with that abominable video. I think Max would benefit from spending a few days with Black Tot and the Seven Others so he’d lose that Maltese sense of entitlement. Having to compete might be good for him. Mofu Mofu. Soo mi misen, Max. That was so bad even Google Translate is crying. Max’s haircuts are now up to $48 plus tip. That represents about 4 six packs of pretty good beer so his days of being a sleek and trimmed Maltese may be numbered. Or worse, DogDad may just try his hand at grooming. I mean, how bad could it be? I do my own beard, surely I could trim a small white dog, right? Ladies and gentlemen, we have a diplomat on the silly dog blog! Come to the front of the class and receive a special award from Max who asserts that you have impeccable taste! If I decide to get another dog, it will have to wear pretty dresses and dance…I would have snuggled Mofu Mofu Max until he begged for that haircut. Sounds like it might be awhile before you get another dog. 🙂 It also sounds like you found that video to have positive or at least redeeming qualities which, frankly, worries me greatly. Having said that, Max would love the snuggles; he is a good snuggler but snores when he sleeps. If you make it past the guys in the rotenburo (outdoor hot bath) you’ve done very well. I do think Elsa could look pretty good in a skirt and bow and maybe Sam could wear lederhosen just because a poodle in lederhosen would be funny. Sorry about the jabs about “poodle cuts” but they just don’t work on Malts. Ah, another fence sitter! That’s Ok, fluffed or trimmed he’s still the nicest little pooch. He certainly doesn’t seem to care although the day of the haircut he must have been cold because he snuggled up against my leg all night whereas he usually hangs out below the AJF’s feet. How did I miss this post?? It’s just too close to mofo. I can’t condone it. I think I prefer the fluffy before pic bc his head doesn’t look abnormally “yuge,” although I will say that he is certainly more butch in the “after shot.” And by the way, I thought the Spanish soaps and game shows had the monolopy on whackjob crazy, but as it turns out, it’s the Japanese. I can’t even stand to see the streets of Tokyo bc of all the sensory overload. But this video is pure acid. You cannot out-weird the Japanese. It never fails to astound me just how strange they can be. The AJF agrees completely. Even she ends up shaking her head. I think Max looks great before and after, Tom. He can go Au Maxeral for all I care. Max looks cute either way. But if he’s personifying (or would that be doggiefying?) onomatopoeia, we can probably guess what his preference is.. I can’t figure out whether he likes furry or trimmed. My guess is that he’d go mofu mofu just avoid the bath at the groomer.